Dry cleaning (or dry-cleaning) is any cleaning process for clothing and textiles using a chemical solvent (a chemical that can dissolve certain compounds) rather than water. The solvent used is usually tetrachloroethylene (perchloroethylene). The solvent is called "perc" in the industry and "dry-cleaning fluid" by the public. It is often used instead of hand washing delicate fabrics. People use dry cleaning because it takes less work than hand washing. The ancient Romans used a chemical called ammonia (derived from urine) and fuller's earth (a clay that can absorb grease and oil.) to clean their woolen togas. Fullonicae were very famous, with at least one in every town of any notability, and frequently the largest employer in a district. These laundries got their urine from farm animals, or from special pots situated at public bathrooms. The workforce made so much money that fuller's guilds (a group that works in solely one job, in this case, making fuller's earth, this special clay.) were an important political force. Also, the government taxed the collection of urine and sent people to jail for wetting their pants. Modern dry cleaning uses solvents that do not use water to remove dirt and stains from clothing. Jean Baptiste Jolly discovered that petroleum-based solvents (chemicals based on fuel like gasoline or kerosene.) can be used for dry-cleaning in the mid-19th century. Jolly was a French dye-works owner. He noticed that his tablecloth became cleaner after his maid spilled kerosene on it. Because of this, he developed a service cleaning people's clothes this way, which became known as "nettoyage à sec," or "dry cleaning". Early dry cleaners used petroleum-based solvents, such as gasoline (petrol) and kerosene. Fire concerns led William Joseph Stoddard, a dry cleaner from Atlanta, to develop Stoddard solvent as a slightly less flammable alternative to gasoline-based solvents. The government started to control dry cleaners because the highly flammable petroleum solvents caused many fires and explosions. After World War I, dry cleaners began using chlorinated solvents. These solvents were much less flammable than petroleum solvents and had improved cleaning power. By the mid-1930s, the dry cleaning industry had adopted tetrachloroethylene (perchloroethylene), widely called "perc," as the best solvent. It has excellent cleaning power and is stable, nonflammable, and gentle to most clothing. However, perc was also the first chemical to be classified as a carcinogen (a chemical that can cause cancer.) by the Consumer Product Safety Commission (a classification later withdrawn). In 1993, the California Air Resources Board adopted regulations to reduce perc emissions from dry cleaning operations. The dry cleaning industry is in the process of replacing perc with other chemicals and/or methods. Traditionally, the actual cleaning process was carried out at centralized "factories"; high street cleaners shops received garments from customers, sent them to the factory, and then had them returned to the shop, where the customer could collect them. This was due mainly to the risk of fire or dangerous fumes created by the cleaning process. At this time, dry-cleaning was carried out in two different machines — one for the cleaning process itself and the second to dry the clothing. Machines of this era were called vented; their fumes and drying exhausts were sent into the air, in the same way as with modern tumble dryer exhausts. This added to environmental contamination. Also much potentially reusable perc was lost to the atmosphere. Much stricter controls on solvent emissions have ensured that all dry cleaning machines in the western world are now fully enclosed. No solvent fumes are vented to the atmosphere. In enclosed machines, solvent recovered during the drying process is returned condensed and distilled. So, it can be reused to clean further loads, or safely thrown away. The majority of modern enclosed machines also incorporate a computer-controlled drying sensor, which automatically feels when most traces of perc have been removed from the load during the drying process. This system ensures that only the smallest amount of perc fumes will be released when opening the door at the end of the cycle. A dry-cleaning machine is similar to a combination of a domestic washing machine, and clothes dryer. Garments are placed into a washing/extraction chamber (referred to as the basket, or drum). The chamber is the core of the machine. The washing chamber contains a horizontal, perforated drum that rotates within an outer shell. The shell holds the solvent while the rotating drum holds the clothing. The basket can hold between about 10 and 40 kg (20 to 80 lb). During the wash cycle, the chamber is filled approximately one-third full of solvent and begins to rotate, agitating the clothing. The solvent temperature is maintained at 30 degrees Celsius (86 degrees Fahrenheit), as a higher temperature may damage it. During the wash cycle, the solvent in the chamber is filtered and then fed back into the chamber. This is known as the cycle and is continued for the wash duration. The solvent is then removed and sent to a distillation unit that has both a boiler and condenser. The condensed solvent is fed into a separator unit where any remaining water is separated from the solvent and then fed into the 'clean solvent' tank. The ideal flow rate is one gallon of solvent per pound of garments (roughly 8 litres of solvent per kilogram of clothing) per minute, depending on the size of the machine. Operators also check clothing for foreign objects before placing them into the machine. Items such as plastic pens will dissolve in the solvent bath and may damage textiles beyond recovery. Some textile dyes are "loose" (red being the main problem), and will release dye during solvent immersion. Operators will dry clean red clothing separately from lighter-color textiles to avoid color transfer. The solvent used must be distilled to remove impurities that may transfer to clothing. Operators checked clothing for dry-cleaning compatibility, including fasteners. Many fasteners that decorate clothing either are not dry cleaning solvent proof or will not withstand the mechanical action of cleaning. Operators will remove them and restitched them after the cleaning. Or, operators will wrap them in a small padded protector. Fragile items, such as feather bedspreads or tasseled rugs or hangings, may be enclosed in a loose mesh bag. The density of perchloroethylene is around 1.7 g/cm³ at room temperature (70% heavier than water), and the sheer weight of absorbed solvent may cause the textile to fail under normal force during the extraction cycle unless the mesh bag provides mechanical support. Many people believe that all marks or stains can be removed by dry cleaning. Not every stain can be cleaned just by dry cleaning. Some need to be treated with spotting solvents; sometimes by steam jet or by soaking in special stain remover liquids before garments are washed or dry cleaned. Also, garments stored in soiled condition for a long time are difficult to bring back to their original color and texture. Natural fibers such as wool, cotton, and silk of lighter colors should not be left in dirty or soiled condition for long amounts of time as they absorb dirt in their texture and are unlikely to be restored to their original color and finish. The main reason that washing in water has a different result than dry cleaning is that water is a polar solvent while dry cleaning uses a non-polar solvent. After the rinse cycle, the machine begins the extraction process, which recovers dry-cleaning solvent for reuse. Modern machines recover approximately 99.99% of the solvent that was used. The extraction cycle begins by draining the solvent from the washing chamber and accelerating the basket to 350 to 450 rpm, causing much of the solvent to spin free of the fabric. Until this time the cleaning is done in normal temperature, the solvent is never heated in dry cleaning process. When no more solvent can be spun out, the machine starts the drying cycle. After the drying cycle is complete, a deodorizing (aeration) cycle cools the garments and removes even more of the solvent, by circulating cool outside air over the garments and then through a vapor recovery filter made from activated carbon and polymer resins. After the aeration cycle, the garments are clean and ready for pressing/finishing. In fact, dry cleaning does not remove all of the solvent. There are no government standards for how much solvent is allowed to remain in the fabric. Detectable amounts of the solvent remain in clothes, with wool clothes retaining the most solvent. Over time, a thin layer of filter cake (called muck) accumulates on the lint filter. The muck is removed regularly (commonly once per day) and then processed to recover solvent trapped in the muck. Many machines use "spin disc filters," which remove the muck from the filter by centrifugal force while it is back washed with solvent. To enhance cleaning power, small amounts of detergent (0.5%-1.5%) are added to the working solvent and are essential to its functionality. These detergents help dissolve hydrophilic soils and keep soil from redepositing on garments. Depending on the machine's design, either an anionic or a cationic detergent is used. Since the solvent recovery is less than 100%, and because dry-cleaning does not remove water-based stains well, entrepreneurs have developed the wet cleaning process, which is, in essence, cold-water washing and air drying, using a computer-controlled washer and dryer. In general, wet cleaning is still being improved and developed, although low-tech versions of it have been used for centuries. Laundry symbols state care instructions. People who make clothes have special symbols to say how they should be cleaned. The international GINETEX laundry symbol for dry cleaning is a circle. It may have a letter P inside to indicate perchloroethylene solvent, or a letter F inside to indicate a hydrocarbon solvent. A bar underneath the circle means that only mild cleaning processes should be used. A crossed-out empty circle means the clothes should not be dry cleaned. Cooked Powder Residue — the waste material generated by cooking down or distilling muck. Cooked powder residue is a hazardous waste and will contain solvent, powdered filter material (diatomite), carbon, non-volatile residues, lint, dyes, grease, soils, and water. Laws say how this material can be discarded. The waste sludge or solid residue from the still contains solvent, water, soils, carbon, and other non-volatile residues. Material removed from the bottom of the stills at chlorinated solvent dry cleaning operations are hazardous wastes. Perc is classified as a hazardous air contaminant by the United States Environmental Protection Agency and must be handled as a hazardous waste. To prevent it from getting into drinking water, dry cleaners that use perc must take special precautions against site contamination. Landlords are becoming increasingly reluctant to allow dry cleaners to operate in their buildings. When released into the air, perc can contribute to smog when it reacts with other volatile organic carbon substances. California declared perchloroethylene a toxic chemical in 1991, and its use will become illegal in that state in 2023. Some alternatives such as CO2 avoids the toxic risks of perc. But, CO2 does not clean some forms of grime as well as perc. Glycol ethers (dipropylene glycol tertiary-butyl ether) (Rynex) (Solvair) — In many cases they are more effective than perchloroethylene (perc). In all cases they are better for the environment. Dipropylene glycol tertiary butyl ether (DPTB) has a flashpoint far above current industry standards, so it is not a fire hazzard. DPTB can dissolve water-soluble stains as well as (or better than) perc or the other glycol ether dry cleaning solvents presently in commercial use. A particular advantage of the DPTB-water solutions of the Rynex product in dry cleaning is that they do not behave like a typical mixture. Rather, Rynex acts as a single substance. This permits a better-defined separation upon azeotropic distillation at a lower boiling point. It also helps reclamation more effectively. Over 99% of the Rynex used can be reclaimed. It also enhances purification using conventional distillation techniques. Hydrocarbon — This is most like standard perc dry cleaning, but the processes use hydrocarbon solvents such as Exxon-Mobil’s DF-2000 or Chevron Phillips' EcoSolv. These petroleum-based solvents are less aggressive than perc and require a longer cleaning cycle. While flammable, these solvents do not present a high risk of fire or explosion when used properly. A hydrocarbon solvent also contains volatile organic compounds (VOCs) that contribute to smog. Liquid silicone (decamethylcyclopentasiloxane or D5) — is gentler on garments than perc and does not cause color loss. GreenEarth Cleaning charges a license fee for using this solvent. Though considerably more environmentally friendly, the price of it is more than double that of perc, and GreenEarth charges an annual affiliation fee. Degrades within days in the environment to silica and trace amounts of water and CO2. D5 produces nontoxic, nonhazardous waste. Dow Corning conducted toxicity tests that found liquid silicone increases the incidence of tumors in female rats (no effects were seen in male rats). But further research concluded that the effects observed in rats are not relevant to humans because the biological pathway that results in tumor formation is unique to rats. (170.6 °F/77 °C flash point). Perchloroethylene — In use since the 1940s, perc is the most common solvent, the "standard" for cleaning performance, and most aggressive cleaner. It can cause color bleeding/loss, especially at higher temperatures, and may destroy special trims, buttons, and beads on some garments. Better for oil-based stains (which account for about 10% of stains) than more common water-soluble stains (coffee, wine, blood, etc.). Perc leaves a characteristic chemical odor on garments. Perc is nonflammable. Liquid CO2 — Consumer Reports rated this method better than conventional methods, but the Drycleaning and Laundry Institute commented on its "fairly low cleaning ability" in a 2007 report. Another industry certification group, America's Best Cleaners, counts CO2 cleaners among its members. Machinery is expensive—up to $90,000 more than a perc machine, making affordability difficult for small businesses. Some cleaners with these machines keep traditional machines on-site for the heavier soiled textiles. Others find plant enzymes to be equally effective and more environmentally sustainable. CO2-cleaned clothing does not off-gas volatile compounds. CO2 cleaning is also used for fire- and water-damage restoration due to its effectiveness in removing toxic residues, soot and associated odors of fire. The environmental impact is very low; Carbon dioxide is almost entirely nontoxic, it does not persist in clothing or in the environment, and its greenhouse gas potential is lower than that of many organic solvents. Wet cleaning — A system that uses water and biodegradable soap. Computer-controlled dryers and stretching machines ensure that the fabric retains its natural size and shape. Wet cleaning is claimed to clean a majority of "dry clean only" garments safely, including leather, suede, most tailored woolens, silk, and rayon. (Neckties seem to be the one exception.) Most perc cleaners use wet cleaning on some garments, but there are only about 20 exclusive wetcleaners in the U.S. Carbon tetrachloride — Highly toxic. Trichloroethane — Overly aggressive and harsh. Stoddard solvent — Very flammable and explosive, 100°F/38°C flash point. CFC-113 - Freon — Ozone destroying CFC. Various commercial products on the marketplace today, such as Procter & Gamble's Dryel, allow elements of the dry cleaning process to be performed in the household using home laundry machines. Though not the complete process that would be performed by a professional dry cleaner, they allow the convenience of home laundry and work for certain types of garments. 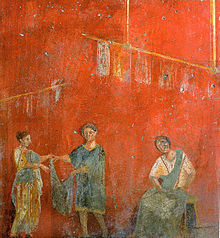 ↑ "Hygiene in Ancient Rome". ↑ "How Dry Cleaning Works". Retrieved 2006-03-30. ↑ 3.0 3.1 Sun, Lena (September 3, 2011). "From curiosity to eureka: Student's project uncovers chemical residue of dry cleaning". Washington Post. p. A1. ↑ U.S. Environmental Protection Agency, Office of Pollution Prevention and Toxics. “Chemicals in the Environment: Perchloroethylene.” 1994-08. Retrieved on 2007-08-15. ↑ "California bans dry cleaning chemical". msnbc.com. 2007-01-25. ↑ Immediato, Linda. "Wet is the New Dry." LA Weekly: La Vida. 2007-01-17. Retrieved on 2007-08-15. ↑ Silicones Environmental, Health and Safety Council. “Fact Sheet: D5 in wetCleaning.” December 2004. Accessed 2007-07-30. Dry clean only? Article about exceptions to "dry clean only" labels. Perchloroethylene (PDF) on PERC and environmental issues.